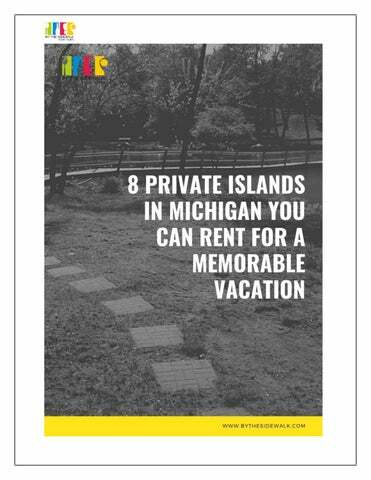 8 private islands in Michigan you can rent for a memorable vacation Want to escape to a private island without traveling all that far? It's possible at these eight Michigan vacation rentals. Some are remote and require a boat ride to be reached; others are accessible via bridges (walking or driving); all offer a unique option for lodging when you're planning your next Michigan vacation. AshKay Island Location: Manchester, Mich., on Iron Mill Pond, about 30 miles from Ann Arbor Details: An eight-acre island that sits within a 156-acre lake. There's a twobedroom, two-bathroom cottage plus a tree house (with a queen bed); in total, the listing can accommodate up to 12 guests. Zeron's Island Location: Sage Lake, about 26 miles west of Tawas City, Mich. Details: A 7.5-acre island with 2,000 feet of sandy shoreline on all-sports Sage Lake. Three-bedroom, two-bath cabin has a sprawling patio and grilling area; pontoons available for rent. Howard Island Location: A mile north of Drummond Island in Lake Huron Details: This privately owned island is heavily wooded with cedars and has two cute log cabins, complete with rustic knotty-pine interiors. One line in the listing we loved: "To watch sunsets and sunrises you simply turn your chair around." Charity Island Location: Near the mouth of Saginaw Bay, with transportation to the island from AuGres, Mich. Details: The six-person Charity Island Lodge is the only structure on this 400-acre island, except for the historic Charity Island Lighthouse. Billed as a nature-lover's paradise, the island is great for hiking, bird-watching and fishing, if you come by way of your own boat. Kayaks available for touring the 4.5 miles of shoreline. Gingerbread in Gull Lake Location: Gull Lake, about 12 miles from Kalamazoo Details: Cross over from the mainland to the island via a walking bridge; there you'll find this charming gingerbread cabin, with a knotty-pine interior and two porches for lounging. Namaste Island Location: Bass Lake in Traverse City, Mich. Details: This 7.5-acre island in all-sports Bass Lake has a renovated log cabin and a pontoon boat for transportation to the island as well as cruises around the lake. Cabin sleeps six. Island near Traverse City Location: Fish Lake, a small lake in Buckley, Mich. Details: Reviewers for this cabin on an island just south of Traverse City loved the peacefulness, seclusion, and quiet. It's connected to the mainland by a little bridge, eliminating the need for a boat for transportation to the island. Republic Island Location: Republic, Mich., north of Escanaba Details: This two-acre island sits in the Michigamme River, affording it tons of privacy and making it an excellent spot for fishing. The vintage cedar cabin sleeps four guests. By The Side Walk FOOD IS A GLOBAL LANGUAGE FOR TRAVEL! 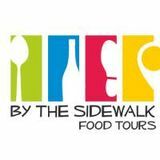 At By The Sidewalk, we have designed our tours for you to explore the coolest neighborhoods through the medium of food. Tastings have been meticulously paired with history, art, architecture and garnished with stories which will leave lingering memories.